One year I went as Fleur-De-Lys and nobody knew who I was…and I found out that I look awful as a blonde, the next year I went as Eponine which was fun! I got the pieces for the costume from a thrift store and got creative with cutting them to look just like the costume from the musical. I’ve gone as Esmeralda for the past 7yrs. now but I hate having my picture taken and each year it’s a slightly different costume. I’m still debating on whether or not I should get a new component for the costume or not. I’m pretty sure I dressed a up as Quasimodo when I was twelve. Both for a school mid evil fair and later on Halloween. Strangely they were completely different looks com each other. Man that thing was painful to wear. I had a special prosthetic glued to the side of my face as well as a ton of other make up and scattered teeth. I remember wishing I put more effort into it even though everyone told me it was the best they had seen. People also said that for my green army guy and giant protesting sand which. I tried staying in character most of the day but that doesn’t work when all I answered my Spanish teacher was my name and age. I just love Halloween.If I can find it, providing it isn’t too embarrassing I might post it. 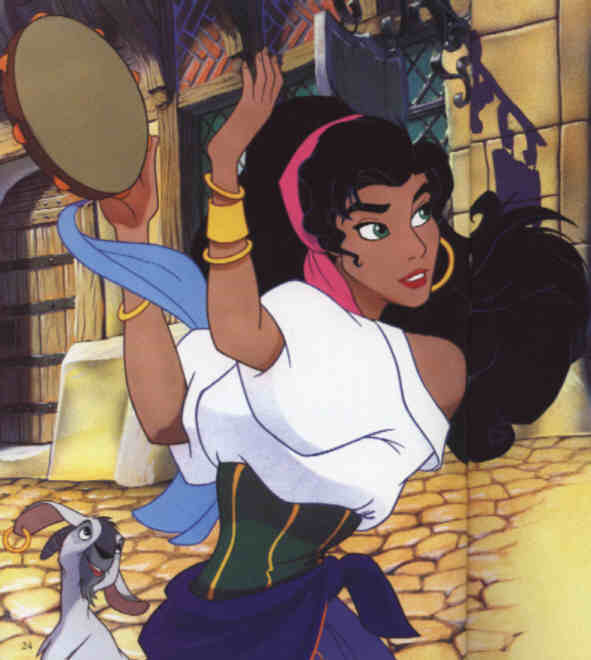 I have a photo of me as Esmeralda for Halloween to throw up here LOL. Where do I send it?